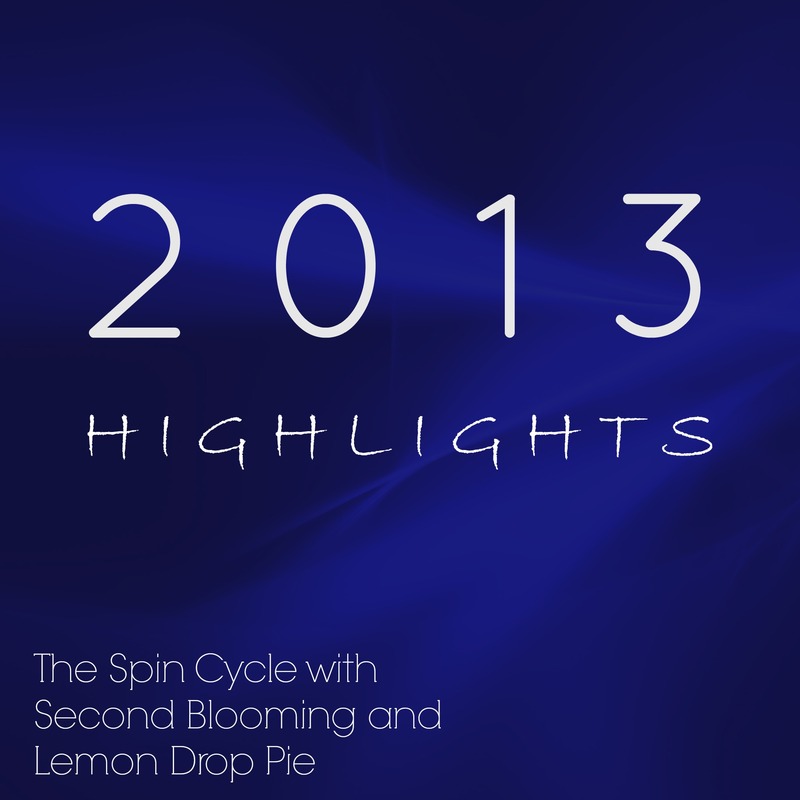 For the Spin Cycle this week, we are sharing our highlights from 2013. This year has been a great year, and it has been hard for me to decide what to write about. Especially since I have blogged about all the good things that have happened to me this year and anything I write will be a repeat of something you have already read! As I was thinking about my Spin, I realized that there was one common element in all the events I was thinking about. I can’t help but think about warm summer days as I write this in cold and snowy January. Last June, we sat under our willow tree in the back yard with Ed’s family, celebrating Father’s Day with a barbeque. The cousins played T-ball while the adults relaxed in lawn chairs. For my aunt’s 60th and my cousin’s 30th birthday, we traveled to Iowa for a barn party. It was hotter than heck, but we danced the night away anyhow. Over the summer, my cousin and her kids came over to the States from the United Kingdom, and I was able to visit with her. I think it had been over ten years since we last saw each other. It was such a joy to see her in person again, and to see my kids playing with her kids! In October, I hosted a family reunion for my dad’s family. As the guest list grew, Ed and I got a little nervous. The final count was 40 people. And then, despite our hopes for a nice October day, it rained. No one cared about the rain, thank goodness! The house was bursting at the seams with family; playing cards, eating, drinking, with plenty of kids for Emmy and Lily to play with. My aunts complemented me on how relaxed I looked! My sister from California flew to Chicago for Thanksgiving, and my brother and sister from Illinois drove to my house. We spent the day hiking in the forest preserve and watching movies. It’s hard to get all four of us together at the same time. Christmas dinner with Ed’s family was particularly nice this year. I felt much more relaxed in the company of my in-laws than I usually do when cooking a holiday meal. Perhaps having 40 people over all at once makes only 9 people over for dinner seem like a piece of cake. Various posts on Facebook and on some blogs ask, “What’s your word for the year?” While I don’t know what my word for 2014 is yet, my highlight of 2013 is definitely Family. Great post! Having my extended family closer and grandkids within 5 miles is awesome for us!!!! Nothing like hosting a big party to make the small ones easier. As for the cold and snow, you have my sympathies. Family sounds like the perfect highlight to have! We had lots of highlights…I loved our family time over Christmas! I would definitely say meeting all my blog friends was another huge highlight for me this year! Family is awesome! My highlights of the year are normally travel, but I almost always travel to see close friends or family! The hot summer days seem so far away, and yet so close! I think our highlight was the recent trip to Denver when nobody told me my kid would catch up, which means maybe they read my blog??? So glad I found you in 2013 and wish you the happiest 2014 ever!!! Kristi Campbell recently posted…2014 Blogging Goals. What they May Be, and What They Should Be. Family is a great word! I’m a weirdo who actually likes winter, but these couple of weeks out of school, etc. have made me miss the lazier pace of summer! Lisa @ The Golden Spoons recently posted…It’s good to have goals . . . . Sounds like you had a wonderful year! This year was overall good for me -my highlight word would have to be celebrations. We were blessed with many last year and my daughter just got engaged a few weeks ago. My word is going to be “Priorities” for 2014. Happy New Year Ginny! Family is a great highlight for a year! I love my family. Even though they may drive me crazy once in a while, I still cherish my time with them. I’ve been thinking a lot about spring/summer lately. The truth is, the living’s just easier! All that light. And getting in your car and driving. No bundling up kids and getting snow in your shoes! And driving on slushy streets. Ugh. tamaralikecamera recently posted…Looking Back and Looking Ahead. I love your list! My biggest highlight was my oldest son graduating from high school. Second was that I hit 25 years of marriage. Kristina Walters @ Kris On Fitness recently posted…New Year New Goals – Happy 2014! Oh, you make me so jealous! I haven’t seen any of MY family (as opposed to Jimmy’s family) in ages. Sad. All so spread out. Sounds like you had a wonderfully family-filled year! What a great year! It’s so nice when you can get family together in one place, especially those that you don’t get to see in person very often. Here’s to an even better 2014! Yes, those warm summer days seem so far away, don’t they? It’s fun to look back at those sunny pictures!